You paid thousands of dollars for your 4-wheel drive! Shouldnt it work when you need it? Whether you use your 4-wheel drive once a year or daily, 4x4 Posi-Lok is the only sure thing. 4x4 Posi-Lok is a permanent replacement for the failure prone O.E. vacuum and electric front axle engagement systems. Allows you to engage the front axle from inside the cab. Engagement every time because you are in direct control. A one-inch pull of the cable ensures you will have 4-wheel drive when you need it, as long as the transfer case is engaged. It is not a posi-trac or locker. 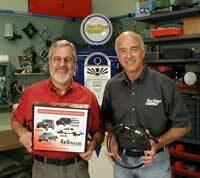 4x4 Posi-Lok was featured in Two Guys Garage "Getting Ready for Winter" series starring Sam Memmolo and Dave McBride. The episode aired on the Speed Channel. It has come to our attention our high quality, American made product, has been "knocked off" by a cheap imitation import! Please be VERY careful while shopping for one of our units. I got to use my posi lock for the first time this week, It worked GREAT! This is a great part, and a killer price. I love having complete control, you guys have a great product. Thanks!! Its The Only Sure Thing!